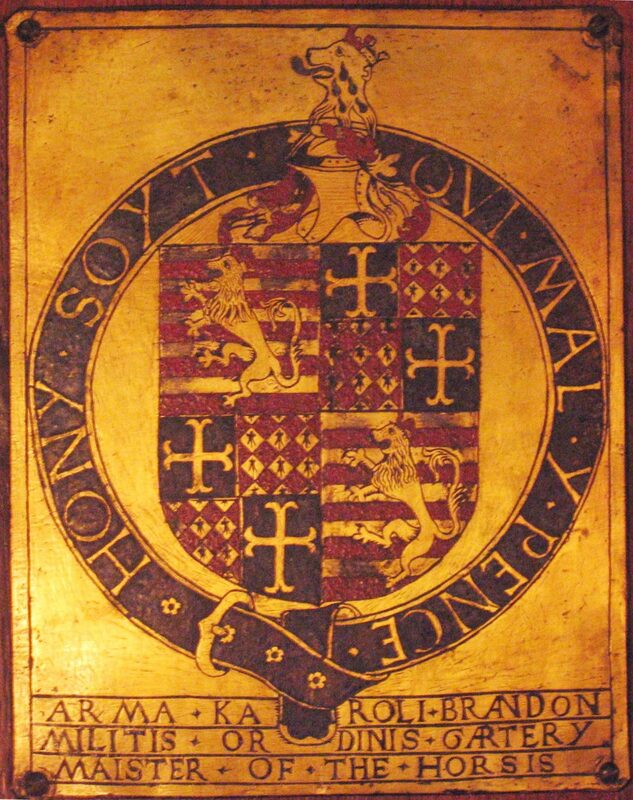 Charles Brandon (1484-1545) was a close personal friend of King Henry VIII who granted him the title of Duke of Suffolk along with many other honours. He was made famous by his great command in the French Campaign of 1513, after which was appointed Knight of the Garter. His stall plate can be seen in the seventh stall on the north side of the Quire in St George’s Chapel. He was also famously known for his marriage to Mary, sister of Henry VIII and widow of Louis XII, King of France. However this royal marriage which took place without the King’s permisson was viewed an offence against royal etiquette. As a result Charles and Mary were banished to the Brandon estates in Suffolk. But the King’s displeaure was quickly forgotten and Brandon advanced to high honour and was successful in becoming Master of the Horse in 1513, as well as receiving many valuable grants of land. Charles Brandon died of unknown causes and was buried at St Georges Chapel on the King’s wishes, although in his will he had requested to be buried at Tattershall in Lincolnshire. A black marble slab now marks his burial place in the South Quire Aisle, bearing an inscription with his name, title, date of death and marital status. The arms of Brandon and his wife, Mary, are contained in two circles engraved at the top of the ledger stone. The current inscription is the third: previously there have been two others, which are both now non-existent. The first inscription, recorded by Ashmole, had disappeared by 1749 and was replaced by a second, suspected to have been the work of Henry Emlyn. The present inscription was carved in 1947-8.